There's nothing like a Florida beach for flat as most Leveler travelers know, though the build-up of resorts and condos has added many a step and stair between you and the shore. Not so on Longboat Key, one of Florida's west coast islets connected by bridges to each other and the mainland. Here you can still find cottages and cabins three-four steps above ground level and at least one motel with no steps. Anyone who vacationed along the Florida shore in the '50s or '60s is guaranteed a case of deja vu. Take the Sandpiper Inn. Couples and families have been coming to this L-shaped, stair-free motel at the same time each year for decades. There's a small pool - think splash rather than swim - in the front. A barbecue grill and tables along the side, lush landscaping, patios for each unit and a gazebo where guests gather to sip the sun down into the ocean each night. Units come with sleeping, sitting, dining and kitchen areas, tiny bathrooms and tile floors. Nothing fancy but what you'll need for a family-type beach vacation. There's always a neighbor who's been here before who can point you to the grocery store and good restaurants. 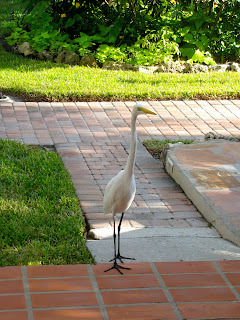 Then there's the resident white egret that stalks lizards and ambles up and down the central sidewalk like an amiable snoop. Sit still on your patio and it will come to see what you are eating or drinking. Open your room door and it will come in for a breath of air conditioning. 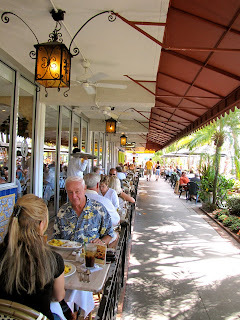 If you want to feel like family, walk across the street to the Blue Dolphin Cafe for breakfast or lunch. It's where the natives go and the staff will know your name and beverage preferences when you come back. It's instant access to the inside track of what to see, do, eat and where to do it best. What to see. 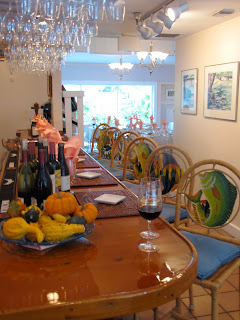 Nearby is the Longboat Key Center for the Arts with exhibits and classes during the season - November to March. At the south end of the key there's the Mote Marine Aquarium. Cross the bridge to the south onto St. Armands and Lido Keys, which John Ringling North of circus fame once owned, and you'll find fabulous homes, chic upscale shopping and dining at St. Armands Circle. The Walking Company, the largest retailer of comfort shoes, is where I found MBTs (!) on sale. Do take a minute to look at the bronze plaques that circle the park around which the shops and restaurants are positioned. Each one pays homage to a famous circus performer or family and is a history of that athletic art form. Across the bridge to the north is Anna Maria Island, a conglomeration of sometimes hippy, sometimes mod and a lot of Jimmy Buffetish kick-back, have-a-beer, chill out and grab some rays attitude. There's a lot to explore on foot and many a saloon to relax in. For 75 cents the Trolley will take you from one end to the other but remember, you're at the beach and schedules are just for appearances. 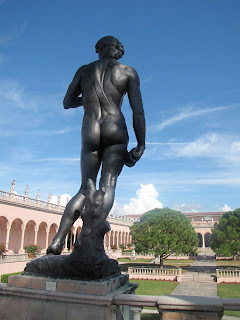 Across the bay is Sarasota with its Ringling complex of Art Museum, circus in miniature, gardens, circus memorabilia and wagons and Ca d'Zan, John and Mabel's Venetian-inspired mansion. Tip: There's a lot of walking in every building so save yourself and wait for the shuttle to take you from one to the other. If you're into the arts you'll be in high sea oats in Sarasota with theater, galleries, dance and interesting architecture galore. What to do. You are in a water and sand paradise and you have to ask? Rent a scooter, take a boat ride (Liquid Limousine Charters can fix you up), canoe or kayak, go para-sailing, try your hand at onshore or offshore fishing (Cap'n Mark Gore's the man to call for that). Dining? Everywhere you look there's a treat or three, especially if it's stone crab season. In addition to the Blue Dolphin Cafe, here are a few to get you started. Ed Chiles, son of the late Florida governor Walkin' Lawton Chiles, has three restaurants that have become local institutions. 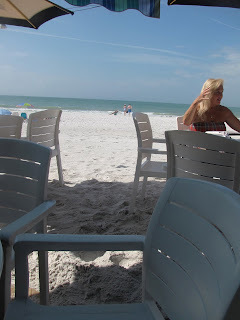 On Anna Maria Island you can sift sand through your toes at either the Sandbar Restaurant (north end) or the Beachhouse Restaurant (south end). On the north end of Longboat Key in historic Longboat Village is Mar Vista Dockside Restaurant and Pub, a quaint dining room with a dock under which the big fish congregate to nibble on little fish. Harry's Continental Kitchens can provide anything from fine wine and fresh produce to catering and fine dining morning, noon and night. The German Apple Pancake at brunch is not to be missed. Euphemia Haye may be the most lauded restaurant in the area and possibly the whole state, with good reason. In an intimate, congenial atmosphere, Chef Ray Arpke and his wife D'Arcy create culinary wonders. Tip: It's well worth climbing the stairs to the Haye Loft to see and taste the remarkable desserts. Go to Food Afar - Recipes from a Travel Writer to see what's in their famous Apple Walnut Pie. Holding down one wedge of St. Armands Circle is Columbia, where crowds flock for the Spanish/Cuban cuisine Casimiro Hernandez Sr. made famous at the original, 1905 Columbia in Tampa's Ybor City. That should keep you going before and after the sun sets. May whatever you celebrate this time of year be glorious and may the new year bring us all peace, health, happiness and many new, easily traversed destinations plus a return visit to one or two old favorites. Who knew a botanical garden of cactus - cacti? - could be so interesting? El Charco del Ingenio in San Miguel de Allende came as a surprise to all of us who traveled there. 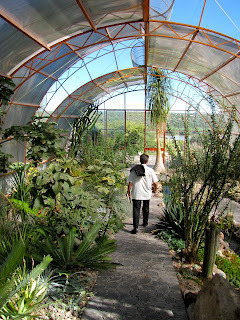 Having the second largest collection of cacti and succulents in Mexico (Mexico City has the largest) in its 167-acre nature reserve doesn't mean much until you see the diversity and hear of the plants' importance to the economy and culture. 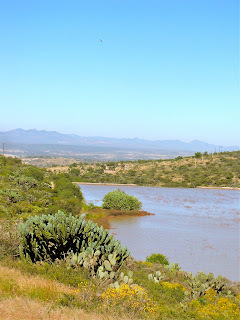 That its location on the upper ridges of the Charco Canyon overlooking a wildlife sanctuary and next to the Las Colonias reservoir provides many Kodak moments helps too. Tip: Don't let this description deter you, Levelers. What you want to see is reached by easily ambled, mostly flat paths. That it is run and supported as a nonprofit by volunteers is impressive. 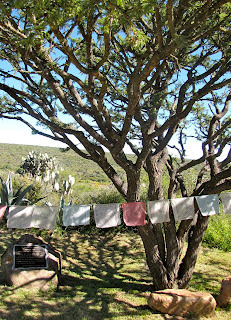 So is that the Dalai Lama came here in 2004 during his first visit to Mexico and sanctified it a Zone of Peace. 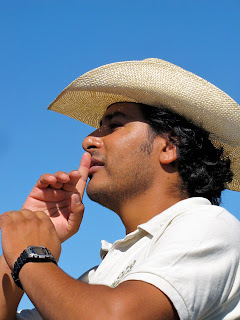 That personable and informative director Mario Hernandez would fit comfortably into an issue of People Magazine's Most Beautiful People doesn't hurt! 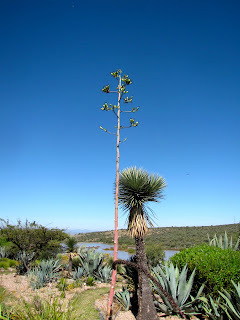 Cacti are the real stars, though, and Mexico is home to 550 different varieties, the world's richest. 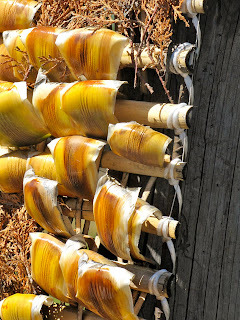 Most are edible with spiritual and medicinal properties. Some even have funny nicknames such as the Golden Barrel Cactus, Echinocactus grusonii, otherwise known as Mother-in-law's seat. or like the tribbles that infested the Starship Enterprise. 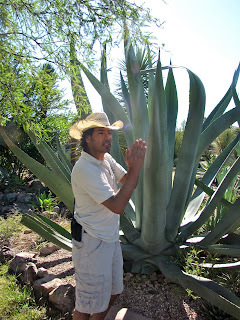 There are 400 different types of agave alone and 60 can be found in the Agave Garden, from the agave asul which gives us tequila to the maguey that produces fiber for ropes and textiles, medicinal remedies, the drink pulque and nutrients and water for man and beast. 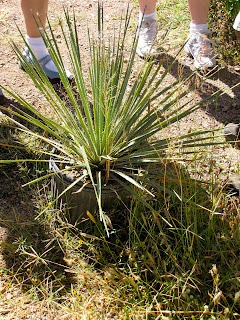 Humans can retrieve a gallon of liquid three to four times a day and a cow can live on the plant alone for around nine months. The Conservatory of Mexican Plants showcases varieties from the collection both inside and out. 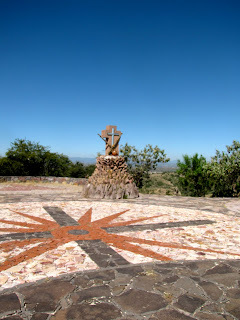 The Plaza of the Four Winds is the primary scenic and ceremonial gathering place. From its outlook you can see three different habitats - dry scrub land, canyon and wetlands - as well as the surrounding mountain ranges - La Margara, Los Picachos and Santa Rosa. Inspired by the 16th century Chichimeca-Toltec codex, the Plaza is where indigenous communities gather for celebrations such as the festival of the Holy Cross (July) and where suchil, religious offerings, are made. You can see where the material comes from, too. Cucharilla, literally "little spoon," are very shiny, soft, curving pieces that look like plastic but come from the base of a cactus-like plant. 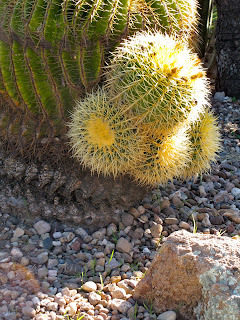 Like many cacti here, it is endangered. 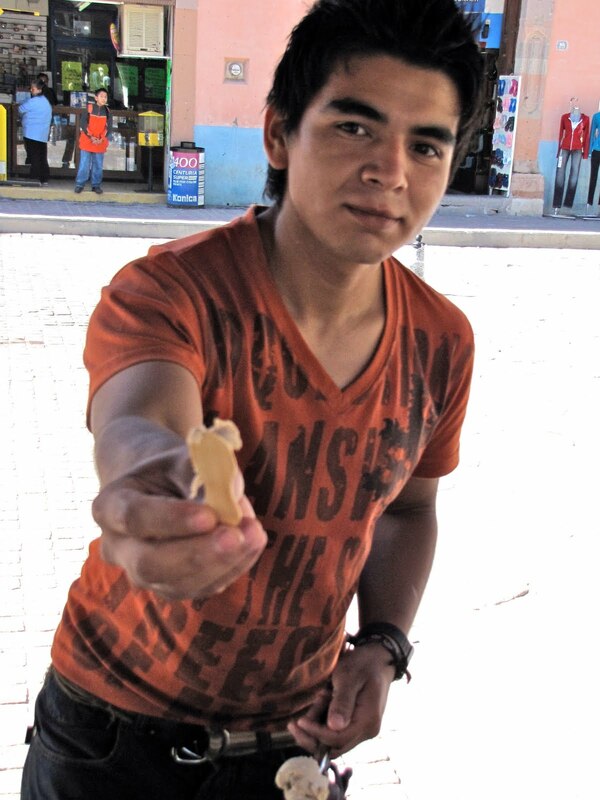 According to Mario, once a year extra specimens are distributed to indigenous peoples who use them in their rituals. Shoppers will be glad to know there's a gift shop and everyone can benefit from the small cafe and nice banyos. 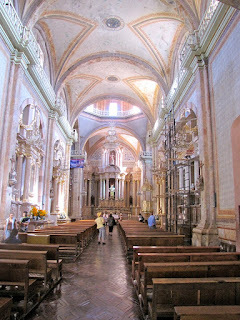 As with almost everywhere else I stopped in the states of Jalisco and Guanajuato, I could have stayed longer. Ah, that most frequent, most hopeful and saddest of travelers' phrases: Next time. I had wanted to travel to San Miguel for years - it's been designated a national monument - no neon, no modern buildings - since 1926. Warning: Located in the Bajio or "low" region of the state of Guanajuato (despite being at around 6,500 feet), it is far from flat but not quite as steeply hilly as the city of Guanajuato. 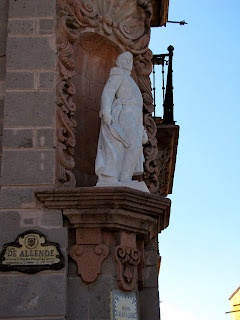 Once called San Miguel de Grande, the city was founded by a Franciscan monk in 1542 and became an important stopover on the silver route from Zacatecas. What 18th century Spanish nobility built, Americans saw and appreciated so much they stayed. Most of the 85,000-plus residents are Americans and Canadians. With English as much a "native" language as Spanish, San Miguel is a Mexican city for Americans and tourists love it - which explains why it's higher on travelers' bucket lists than Guanajuato. 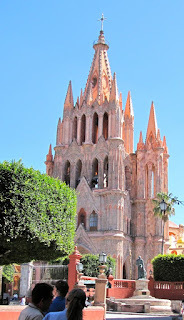 First-time visitors start with La Parroquia de San Miguel Arcangel (San Miguel Arcangel Parish), the pink-stone, Gothic church completed in 1730, and El Jardin Principal, the square that fronts it. La Parroquia's distinctive tall tower was part of an 1880 remodeling project by master builder/mason Serefino (or Zeferino - I've seen it both ways) Gutierrez who, they say, based his design on images he saw on postcards from Europe. In more recent history, a mayor mistakenly thought pink paint would jazz up the church's towers. Outside, feast day decorations and offerings were displayed while inside, the aroma of lilies permeated the hushed church when I visited. 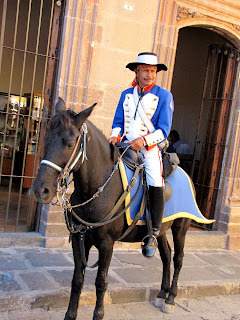 Oh, and those men on horseback costumed as Mexican revolutionaries? They're the local police. Tip: This large area is blissfully flat. Just behind Parroquia to the right (as you face it) is a nice public bathroom that has a change-making machine (for pesos)! 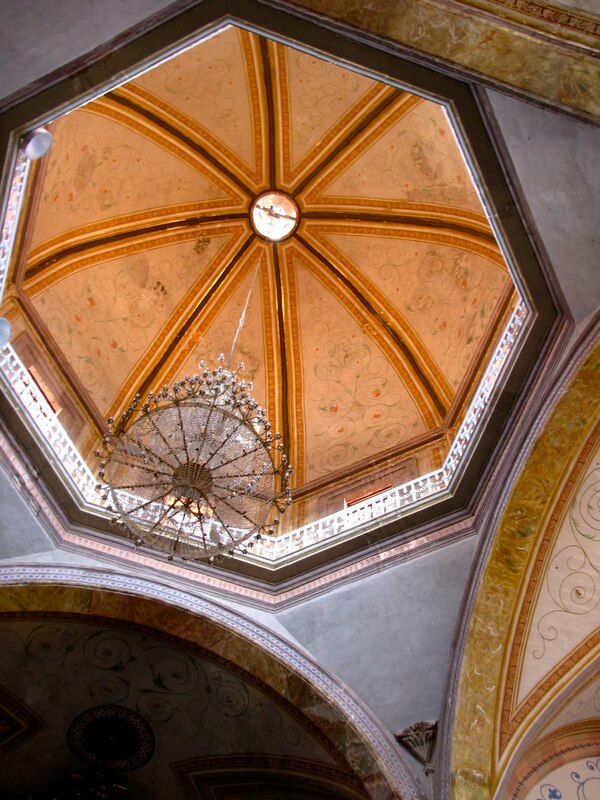 Casa de Allende, the mansion immediately across the street from Parroquia, is an outstanding example of 18th century architecture and the birthplace of Don Ignacio de Allende, the hero of Mexican independence whose name the city adopted. It is now a museum with a collection of artifacts, historical documents and contemporary art. Facing Parroquia across the square is the historic City Hall. Directly behind Parroquia is La Capilla, an excellent restaurant with a grand rooftop view. Tip: Bugumbilia is another restaurant you ought to try. Don't miss the Chiles en Nogada if they are on the menu. (You can find the recipe at my other blog, Food Afar - Recipes from a Travel Writer, www.foodafar.blogspot.com/2009_10_01_archive.html, but your eyes can't show your mouth how good these are. Shopaholics will be in heaven in San Miguel. Each store seems more enticing than the next, with good collections of fashions and decor plus the usual tourist fare. Sit at a sidewalk table anywhere around the square and vendors will bring merchandise to you. They can be pesky but if anything catches your eye, look it over and keep saying, "No, thank you," and you'll eventually be offered a true bargain. 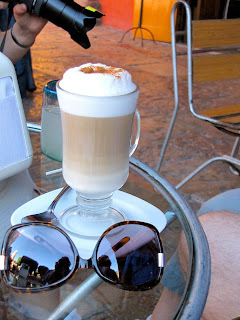 Cappuccinos and cervesas are good and cheap, too. The first art school in Latin America was founded here and San Miguel is a haven for artists of all kinds - theatrical, musical and visual. The great Mexican entertainer Cantinflas spent time here and brought other thespians and movie stars along. A week does not pass without concerts, plays and exhibitions of some kind. Writers have been attracted here, too - Jack Kerouac, Allen Ginsburg, William Burroughs and Ken Kesey among them. Missed the week's plays and concerts but I have two recommendations for the visual side. Centro Cultural 'El Nigromante,' the National Institute for Fine Arts, is housed in what was a 1754 convent for the Templo de la Concepcion's nuns hat is two relatively flat blocks west of El Jardin. Exhibits of contemporary art and classes in painting, drawing, sculpture, music and dance fill its high-ceilinged rooms and landscaped courtyard. There is a striking contemporary mural by David Alfaro Sequeiros. Farther away - Tip: Take a cab - is Fabrica la Aurora, an art and design center that is one of San Miguel's most interesting destinations. A former, turn-of-the-century textile mill has been transformed into a rambling display of eye candy. Working artists have studios here as do architects and designers and there is a cafe but most of the space is filled with painting, sculpture, furniture, jewelry, antiques, linens and high end accessories. Festivals are almost as common as the sunshine; www.whatshotinsanmiguel/festivals is a good place to go for info on what and when. It's called the Sistine Chapel of Mexico although few have ever heard of its artist. The church, with its graceful, curving lines outside, is a tribute to the suffering of Christ and the martyrs who followed Him inside. While traveling in Mexico, we stopped here en route to San Miguel de Allende. 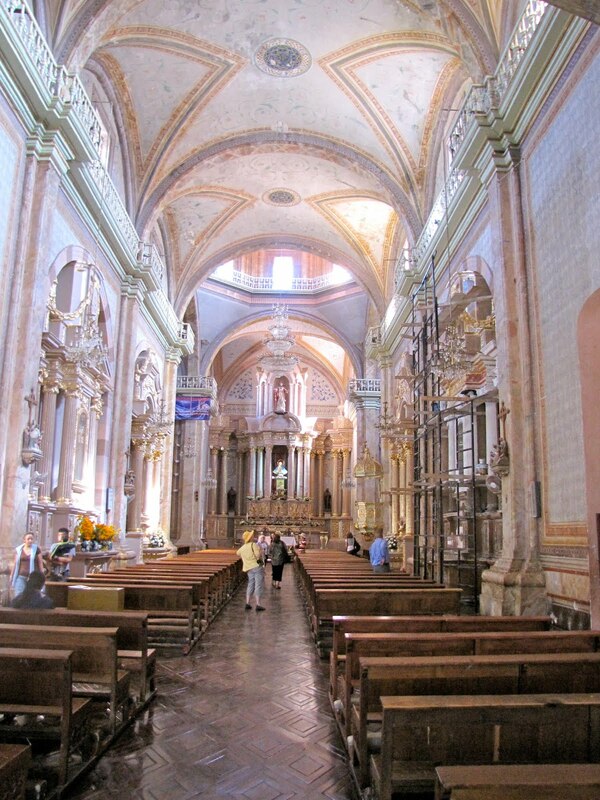 Built in the mid 18th century, the Sanctuary of Atotonilco has been a place of retreat and pilgrimage since 1880. As many as 100,000 faithful converge on this small village each year to experience some of that suffering. In groups of 5,000 to 10,000, they descend during 30 weeks a year, sleeping in cold cells, crawling around the sanctuary on bare knees, wearing crowns of thorns and whipping themselves. 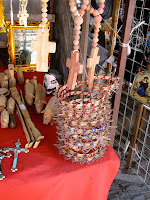 On non-pilgrimage weeks like the one during which we arrived, it's a dusty, one-main-road village with vendors opposite the church selling food and religious souvenirs including crowns of thorns - and yes, they are sharp - and knotted rope whips. Tip: Rejoice, Levelers, it's flat here! Inside this endangered World Heritage Site is a wonder of murals that cover the walls and ceilings. Reminiscent of the earliest Byzantine Christian chapels that told their congregations the story of Christ through paintings and/or mosaics, these murals do that plus illustrate the gory ends of martyrs. 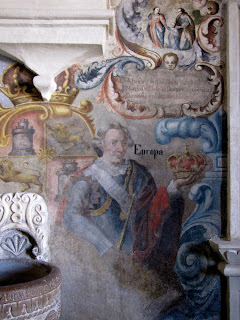 Damaged over the centuries by weather and zealous visitors who scraped paint off the walls to take home, the murals are now being restored. Commissioned by the church's founder, Padre Luis Felipe Neri de Alfaro, and painted by Miguel Antonio Martinez de Pocosangre, these are exuberant, heart-felt works of art. It's easy to see how generations of Mexican artists turned to mural painting. The sanctuary is known for its sculpture, too, notably Our Lord of the Column. 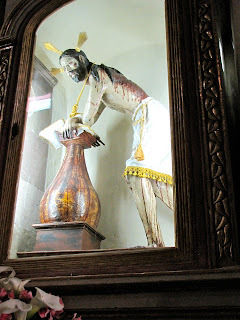 Miracles have been attributed to it and at the beginning of Holy Week celebrations it is carried in a midnight torchlit procession the seven miles from Atotonilco to San Miguel de Allende where it remains through that week. Nearby hot springs (Atotonilco means "place of the hot waters) long have been revered as places of healing. 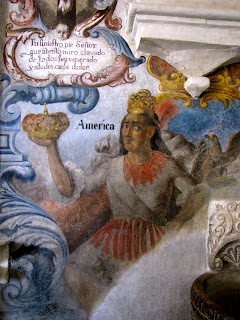 Followers of Mexican history have other reasons to visit the sanctuary. 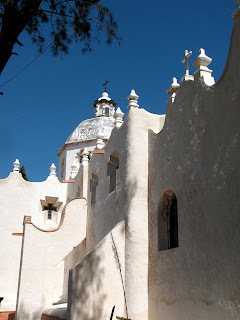 Native son and revolutionary leader Ignacio Allende was married here. 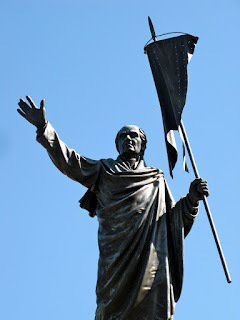 And Sept. 16, 1810, Father Hidalgo led that ragtag army here, grabbed the banner of the Virgin of Guadalupe and used it as their standard in the fight against the Spanish. Tip: Sunday, market day, you'll find more vendors, residents and visitors. Atotonilco is so close to San Miguel it makes a good stop if traveling to that city or a good day trip from there. Yup. Cheese, guava and tequila too. They're all good - well, maybe not the shrimp so much - in this city known for Talavera ceramics, ice cream, pork rinds and revolutionary announcements. It was another high spot in our Mexican travels. It was here, then a poor village with a population primarily of Indians known simply as Dolores, that Father Miguel Hidalgo y Costilla made his famous Grito, the call for independence. On the night of Sept. 15, 1810, Father Hidalgo and Ignacio Allende, who had been plotting a revolution, learned that their plans for insurrection had been discovered by the royalists. 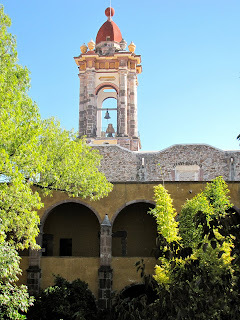 The following morning, Father Hidalgo rang the church bell for mass and made the call for freedom from the atrium of the parish church. The two men marched their ragtag "army" of followers to San Miguel, Celaya and Salamanca, gathering more insurrectionists at each town until it reached 20,000 and arrived at Guanajuato. Levelers will like Dolores Hidalgo because it's pretty, interesting and, best of all, mostly flat. Residents are very proud of their history and heritage. Tip: There are a few easy steps up to that cradle of freedom church. The small church, inside and out, is quite pretty and side streets around it are intriguing. 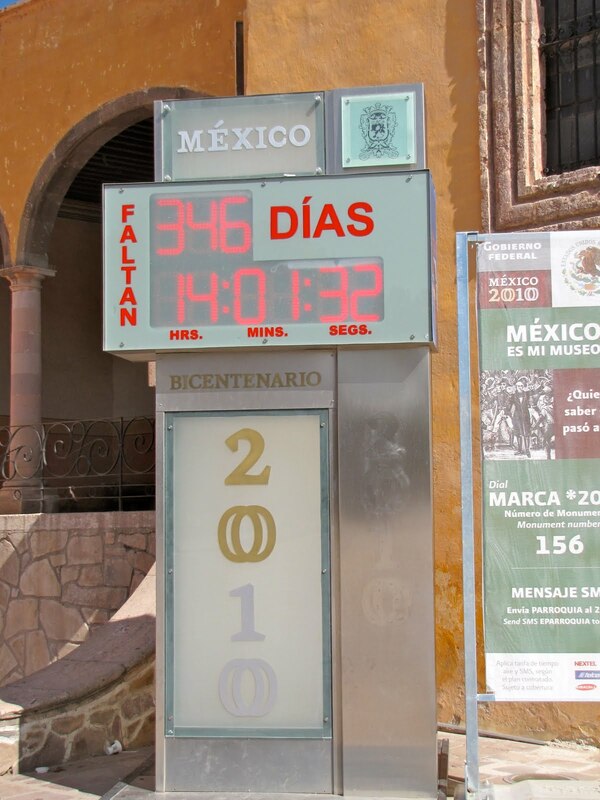 In front of the church is a box that automatically counts down to Mexico's Bicentennial. You see them in a number of spots around the country but here it has special meaning as they consider Father Hidalgo's announcement the beginning of their country's freedom. The church faces the main square with its statue of Father Hidalgo, bandstand, shoe shiners and ice cream vendors at each corner. Those vendors were incredibly generous with their samples and yes, I did try a lot before settling on a tequila-flavored ice cream cone. You can't leave here without trying one. We left without trying and seeing a lot else though. 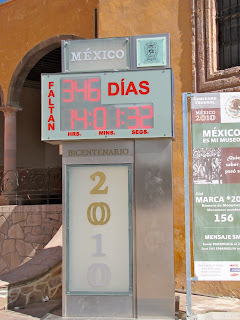 No time, said our guide, as we were en route to San Miguel de Allende. There are museums to see, including Father Hidalgo's former home, as well as a number of Talavera pottery artisans (Father Hidalgo, one of the rare priests who cared about the natives, taught them to make these beautiful, Majolica-like ceramics.) I would have liked at least a day here. Southern gringos will get a kick out of the fried pork skins as well as the ice cream. 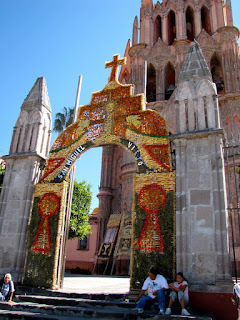 Never did find out how these traditions started in Dolores Hidalgo. As we say sadly and too often during our travels, "Next time."